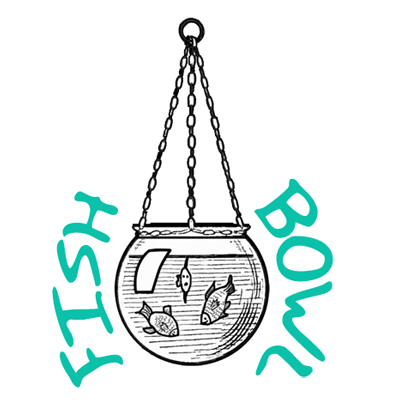 Do you want to learn how to draw a cute hanging fish bowl with fishies swimming around in it? Fishies and fish bowls aren’t always easy to draw, but after seeing how they are drawn, I bet you will shock all of your friends with your drawing abilities. I have put together a step-by-step tutorial that will help you figure out how to draw a hanging fish bowl by using simple shapes to build up the form. This is an intermediate cartooning tutorial that younger kids, teens, and adults will enjoy. Even some younger children might be able to draw fish and its bowl if you stand by to help with the instructions. Enjoy! Start out the hanging fish bowl lightly sketching out a circle. Find the middle of the circle and then draw a light vertical line straight up through the circle and beyond. Now draw in most of the circle (except for the dashed circle line above). At the top of the fish bowl, draw a small outwards slanted line on each side of the bowl. Then attach the top of the left line to the top of the right line. Also draw a line from the bottom of the left line to the bottom of the right line. It sort of looks like a fish bowl already. Great job. Notice that I changed the curve of the fish bowl lines that we just drew. Now it looks even more like a fish bowl. Now draw a diagonal line from the top of the line to both sides of the fish bowl. This will be the chain that the fish bowl is held up with. Also draw a circle at the top of the line. Now just erase the lines that you don’t need. Darken the lines the outside lines and put in details of the fish. Put curved lines on the right side of the fish bowl to show shadowing. You might one to draw in the fish bowl’s glare by just drawing 2 inward curved lines that you connect with a straight line. Draw curvy ‘u’ lines for the fish’s scales.